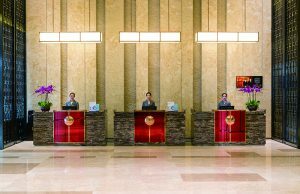 Qingdao, Shandong, December 30, 2015 /ChinaNewswire.com/ - AccorHotels announces the opening of Pullman Qingdao Ziyue. The newly-built hotel featuring 238 rooms is the latest upscale address to be added in the fast growing Pullman network in Greater China where the brand’s portfolio has grown to 26 operating hotels. Located in Chengyang District, Pullman Qingdao Ziyue is just a 5 minute drive from Qingdao Liuting International Airport, with easy access to Qingdao city centre and local attractions including the Laoshan mountain, often regarded as one of the "cradles of Taoism". The Qingdao International Expo Centre is only at 30 minutes away. The 238 well-appointed rooms and suites feature the signature Pullman bedding concept with memory foam pillows, a separate bath and rain shower, coffee and tea making facilities, flat-screen TVs with a broad satellite channel selection, a docking station for electronic devices, and Wi-Fi connections, connecting guests with enjoyment, efficiency and well-being, business and leisure. Pullman Qingdao Ziyue provides an extensive line up of dining options for guest to experience different culinary cultures. The hotel’s Chinese restaurant “Feng Fu” serves authentic Shandong cuisine and also has a spacious private dining room that can host up to 20 people making it ideal for a business lunch and an intimate family gathering. The all-day dining restaurant “Le Cafe” offers a selection of international buffet and à la carte menu option. At the hotel’s Shanxi restaurant “Jin Fu”, guests can relish in traditional Shanxi cuisine such as noodles, pork, beef dishes and experience the unique Northwestern cooking style. Pullman Qingdao Ziyue boasts a 1,700 square metres’ conference and banquet facility including a 900-square-metre pillarless ballroom that can host up to 600 guests and five meeting rooms that can be configured into various sizes for corporate events, weddings, meetings and gala dinners.